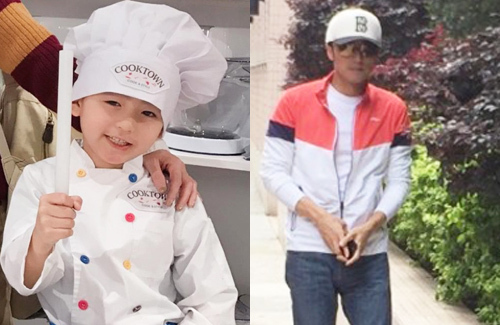 Nicholas Tse (謝霆鋒) and Cecilia Cheung (張栢芝) have been divorced for nearly six years, but they continue to make efforts to remain on friendly terms for the sake of their two sons, Lucas Tse and Quintus Tse. Although Nicholas was initially rumored to be an absent-and-detached father, the 36-year-old actor has been spending more time with his children. For Quintus’ seventh birthday, Nicholas decorated the house and even personally cooked for the occasion. Noticeably absent from the event was Nicholas’ girlfriend, Faye Wong (王菲), as well as Lucas and Quintus’ mother, Cecilia. Although Nicholas and Cecilia remain on friendly terms, they are hosting two separate celebrations for Quintus’ seventh birthday. Earlier, Cecilia was spotted at the airport flying back to Hong Kong from Shanghai. Due to her busy work schedule in Mainland China, she has been traveling between Mainland China and Hong Kong.